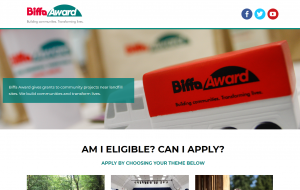 After obtaining a brief from the Wildlife Trusts we set about redeveloping the Biffa Award website to the new specification. The old website had many links that guided the user to a dead end or complicated the user journey and as such the new website was designed to be streamlined and to guide the user to the correct place. The home page contains a number of signposted links to carry out activities on the site. The site itself was built on top of a premium wordpress theme with layout and functionality customisations as requested by the client. The theme contained the site origins page builder and a number of custom page builder widgets were created to support the site functionality. In addition to this a custom postcode lookup was created using google maps geocoding which allowed the site to determine a user’s eligibility for project funding based on their distance from a Biffa recycling operation. The project was completed well and we have an ongoing relationship with the wildlife trusts. HTML Studio is a web design & website development agency based in Leicestershire, covering Coventry and the whole of the UK. We work hard to create high quality websites, mobile applications and website applications that help you achieve your business goals.